Welcome Home to Paradise! 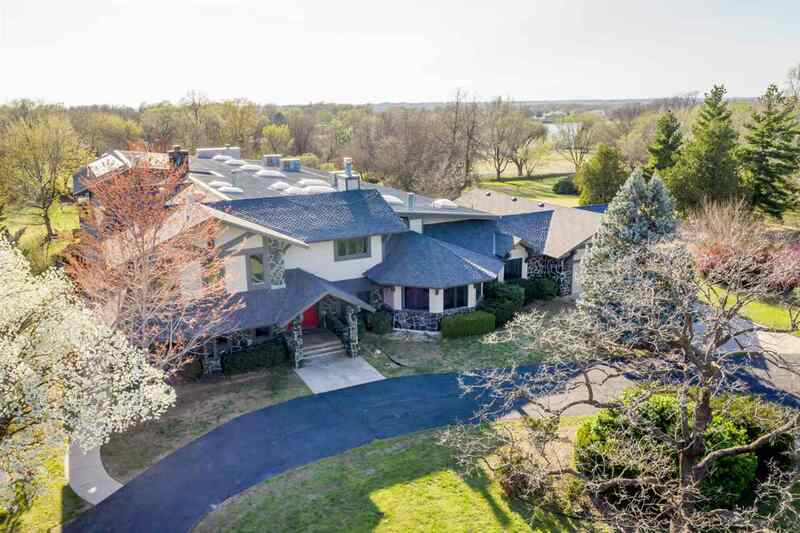 Sitting on over 6 acres, this serene 5 bedroom, 7 bath, 12,700+ sq ft home features vaulted ceilings, brand new HVAC unit, two-way fireplace, a rec room, bedrooms with private decks and spacious living arrangements! Whether you need space to work, play or relax, you can find it right at your new home with a separated office area upstairs built in cabinets and decks, a spacious pool and hot tub room featuring large windows, palm trees and a waterfall into the Koi pond. After you pass the oasis of the pool area, you'll enter into a connected, but set apart living area featuring a large kitchen/dining area as well as two more bedrooms! Each bedroom in the home has it's own separate bathroom. To the south end of the property you will find both tennis and pickle ball courts. This home cannot be replicated or built for the price it is being offered at today. All information deemed reliable but not guaranteed. Seller is a licensed broker in state of KS and has vested interested in Equisset, LLC.